Land Shark!! : SB Rings and a SCF Game 7!!!! SB Rings and a SCF Game 7!!!! There were 2 great events going on last night in the city of Pittsburgh! 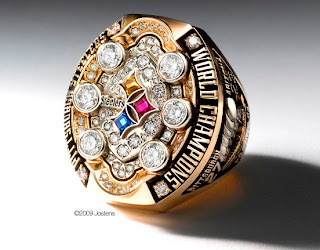 The Superbowl Champion Pittsburgh Steelers received their XLIII rings and the Pittsburgh Penguins, in front of several of those Steelers, took their team to a Game 7 of the Stanley Cup Finals! There are a few similarities to these two teams. The Steelers had to come back in the last few minutes of Superbowl XLIII to capture the Championship. 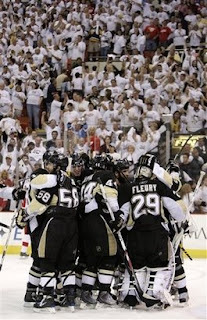 The Penguins came back from being down 2-0 and 3-2 in games to force a Game 7 so that they can win the Cup in Detroit, where the Steelers won their 5th Superbowl!! Click here to see all 6 Rings together.